Now with FREE Shipping to U.S. destinations! Exclusive HMBIM Logo Merchandise is now available in our online store! There are special prices on our 2011 inaugural year shirts, and other apparel without any dates are available as well, including the very popular Brooks lightweight running jackets! Note: All sales are final. No refunds, exchanges or returns accepted. Our logo-ed run jacket from Brooks Running features the HMBIM Logo (no year) embroidered on the front are beautiful jackets to run, or just to wear around to show your athletic prowess! The Nightlife Essential Run II jackets are windproof, water-resistant essentials pack the perfect weight and brightness for chilly, dark conditions. Underarm stretch panels provide a better fit and added breathability. We've paired black with NightLife and Brite Green to make you more visible on your runs after dark. This is a Men's Size S.
These jackets sell for the same price on the Brooks website but these are customized with the HMBIM logo! Click here for a detailed sizing guide. This is a Men's Size M.
This is a Men's Size L.
These HMBIM jackets were very popular at the 2012 HMBIM! Our logo-ed run jacket from Brooks Running features the HMBIM Logo embroidered on the front and the HMBIM square on the back. The Brooks Essential Run Jacket is great to wear year around due to its light weight and versatility. What every runner needs: a lightweight, water-resistant jacket with front-to-back retroreflectivity. Another nice touch? The zippers on the pockets have easily grabbable pulls -- even if you've got gloves on, you'll be able to open and close them. A great layering piece for spring and fall. John "The Penguin" Bingham loves this jacket: "There are plenty of good ones out there, but for me the number one pick has to be the new Brooks Essential Run Jacket in the dayglo yellow. No, it’s not subtle, and that’s the point. If you’re going to be out there running on the roads you want to be seen.... This jacket can be seen." This is a Men's Size XL. This is the 2012 Men's Size XL Brooks Podium SS Shirt which retails from Brooks at $24.00 without any customization, and the bright green is great to ensure you are seen when on a run! 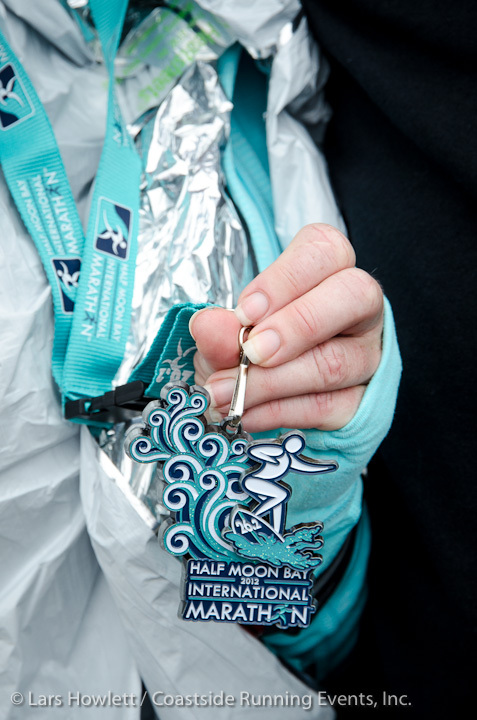 The 2012 layout was derived from the design of the HMBIM Finisher's Medal which depicted Moony, the HMBIM Logo Runner, surfing the waves at the Mavericks Invitational, the legendary surf contest in Half Moon Bay. This technical short-sleeve shirt is a must-have for any athlete; transfers moisture away from the skin, keeping you dry and comfortable. This is a size XL. This is the 2012 Men's Brooks Podium SS Shirt which retails from Brooks at $24.00 without any customization, and the bright green is great to ensure you are seen when on a run! This is a size 2XL. Get this great Headsweats Go Race Hat with the HMBIM Logo, and our famous slogan, "26.2 Miles of Running Heaven" embroidered on the brim! This unique poster shows a very creative look at the Half Moon Bay Coastside and the HMBIM Course. Created by art professor and renowned graphic artist Jonathan Weast, the poster from the HMBIM event is an amazing keepsake. Looks incredible in your garage, in a game room or any location celebrating your special achievements. Local Coastsiders will love the poster whether or not you ran the event for its whimsical and colorful look at the Coastside.